A beautiful home! I downloaded it. Congratulations on your win! You are such a talented builder. 🙂 Thank you for sharing, too! Thanks so much for the complement! I am really surprised and happy about it! Im glad that others will enjoy it too! I agree, you are really a talented, inspired builder! This house looks gorgeous outside and in, and great layout inside and use of the backyard areas! 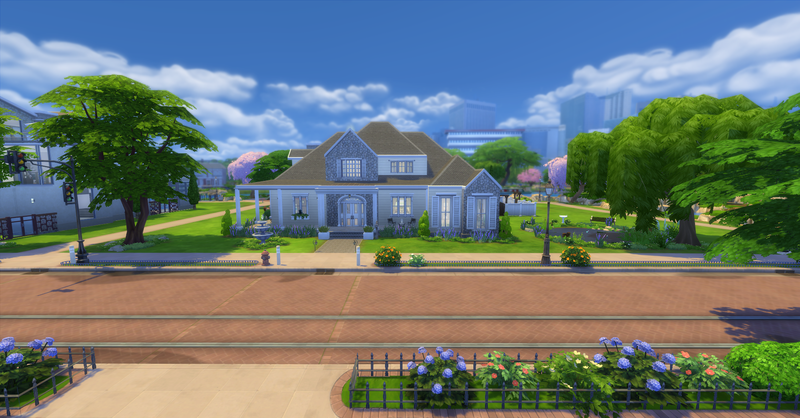 I downloaded it, planning to put it in Newcrest Bluffs. Thanks so much! I glad you enjoy it! I would ove to see picks of other families living there to see how they utilize the space. Congrats! It’s a beautiful home. I love the outside garden area that is below ground. Super cool idea. Thanks so much! That is only the second house I have built like that. Since there is no terrain tool this is my version of a walkout basement.